Stone is an investment, not only of money but of care over time. If you take care of it, it will last a lifetime. With a regular routine of cleaning and maintenance, your stone can remain strong and radiant for years. Do I need to supply any information when picking out my stone? After making a decision on which type of product is right for you, you can hand-select your slab and put down a deposit on the perfect piece for your space. We’ll then come to your space and use our LT-55 Laser Templator to get precise measurements. This usually happens within 1-3 days of your deposit being placed. Bring your sinks to us as soon as possible after putting down your deposit so we can lay out finalized plans once your measurements are confirmed. After all of your measurements are finalized, we’ll use our Slabsmith technology to configure the best arrangement of your slab in your space for the most functional and aesthetically pleasing of results. Within 1-2 weeks of the measuring being completed and the sinks being received, we’ll come out to install your pieces, which usually takes about a day. How long does it take once I select my slab? What are my countertop edge options? View the edge types here. 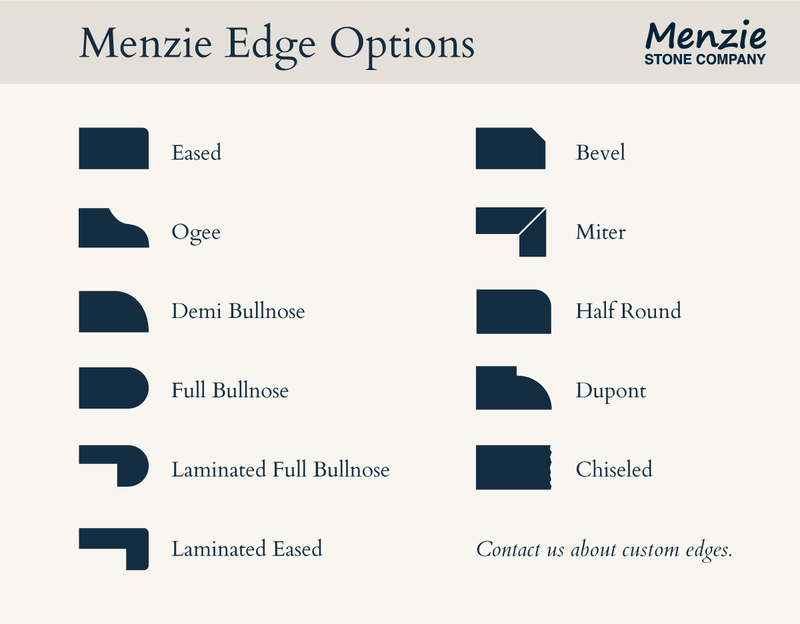 Contact us about custom edges. What happens if my stone gets stained? Accidents happen. If you try a regular, household cleaner first and the stain still won’t come out, try using one of our deep cleaners and poultice. Stop by our showroom today to pick up your cleaning products! Using one of our deep cleaners and poultice, mix into a paste. Doing this provides added stain-pulling properties. Apply the paste approximately ¼” thick to the stained surface so that it extends at least 1" beyond the edges of the stain. Cover the paste with plastic, and tape the edges of the plastic to the surface with painter’s tape. Let it stand for 24-48 hours, and then remove the plastic and paste with a non-marring tool such as a plastic putty knife. If the stain is not removed, try repeating the process a second time. If that still doesn’t work, try using Elite Cleaner by Omni (sold at our showroom) to “scrub” stains from the surface. Note that if you use this method, we recommend resealing your countertops after the process is complete. How do I know if my counter needs to be resealed? Here’s a quick test: Pour water on your counter and wait for about 15 minutes. If your countertop has changed colors because the water has absorbed into the stone, then it needs to be resealed. If the water is still in a puddle and the stone surface looks exactly the same after you wipe up the water, then you’re good to go! How do I reseal my counter? Always follow the manufacturer's instructions on your sealer. Generally, resealing involves cleaning the area of any debris with a soft cloth and water, letting it dry and then wiping sealer on the surface. After letting it sit for 10-15 minutes, wipe it dry. What kind of household cleaner should I use? Don’t use harsh household cleaners or abrasives, and we don’t recommend using vinegar or lemon juice. Instead, we recommend using Omni Clean & Reseal. While some household cleaners will slowly remove your surface sealer over time, Omni Clean & Reseal will, with regular use, preserve the beauty and integrity of your counters for prolonged life. Can I place hot pots and pans or cold drinks directly on my stone? We recommend getting into the habit of using coasters under drinks and trivets or mats under pots and pans to avoid damage. Do I need to reseal my stone once it’s been initially sealed? Ultimately, sealer is not indestructible; it just stops stains. So we recommend resealing it with Omni Sealer at least once every couple of years. How often should I clean my stone? Wipe counters to remove crumbs and debris with a sponge or soft cloth, and be sure to wipe up spills immediately. Can I place hot pots and pans or cold drinks directly on my quartz? We recommend getting into the habit of using coasters under drinks and trivets or mats under pots and pans to avoid damage. While quartz is structurally more heat-resistant than many other stones, sudden and rapid temperature changes could be detrimental to your stone, especially near the edges. Can I cut directly on my quartz countertop? While quartz surfaces are highly scratch-resistant, we recommend using a cutting board just to be safe. How should I care for my quartz countertops regularly? Simply use a damp, soft cloth with warm water and soap or non-abrasive, household cleaner to regularly remove debris and to wipe up any spills immediately after happening. What happens if my quartz gets stained? Always refer to your manufacturer's care guide for cleaning and maintenance. In general, first, try using a mixture of soap and warm water. If that doesn't work, try using a non-abrasive, household cleaner such as Soft Scrub Liquid Gel or Comet Soft Cleanser Cream to wipe the surface. Always use a plastic putty knife to remove any adhered material such a food, gum or nail polish. Do I need to seal my quartz? No. Quartz is a non-porous surface, so it’s not necessary. I cleaned out a scratch/stain with a light-duty scrubbing pad, and the area is not as glossy as the rest of the countertop. What do I do? We recommend using only use a mild abrasive with a blue or green Scotch Brite® pad for solid surfaces installed with a matte finish. If the surface was installed with a gloss finish, stick with an ammonia-based, household glass cleaner like 409® and do not use a pad of any type. How do I care for my solid surface on a daily basis? Due to its non-porous attribute, there is no wax or sealant required or any special care of the product. Normal cleaning only requires soap and water or damp cloth with a mild household cleanser. If you have chosen a matte finish, you can use an abrasive household cleaner. When you do so, we recommend periodically cleaning the entire surface in a circular motion to maintain uniformity. However, avoid using strong acidic cleaners, which have the potential to cause whitening. Can I place hot pans or pots on my solid surface? We recommend getting into the habit of using trivets or mats under pots and pans to avoid damage. While solid surfaces are structurally very heat-resistant, sudden and rapid temperature changes can cause yellowing and damage to the surface. How do I repair a scratch or a cut? Scratches and cuts can be buffed away with a light-duty scrubbing pad and a mildly abrasive, household cleanser. Clean thoroughly with soap and water and let dry. For knife cuts, deep cuts, gouges and chips, contact your certified professional. The damage is repairable, but it may require special tooling and expertise. Will repairing or refinishing my solid surface alter the original color and finish? No, solid surfaces are homogenous with no directional properties; meaning the color and materials are consistent throughout. This gives the surface a cutting edge in maintaining and restoring its like-new and original look over other surface materials.